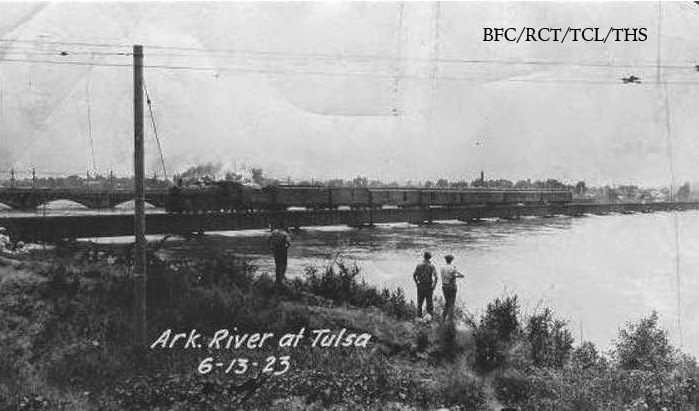 Tulsa has a history of flooding from the Arkansas River as seen in photo taken in 1908. 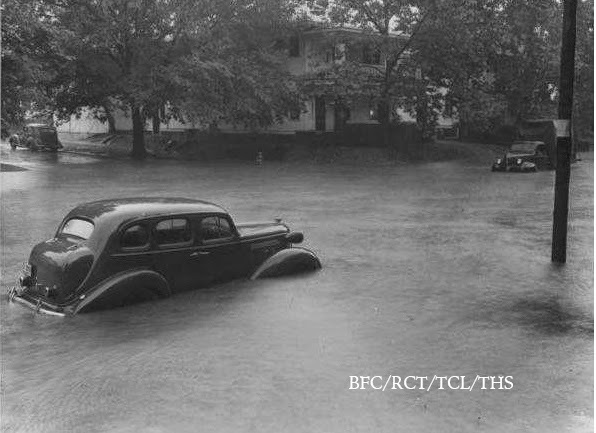 Another notable flood of the river happened in 1923. 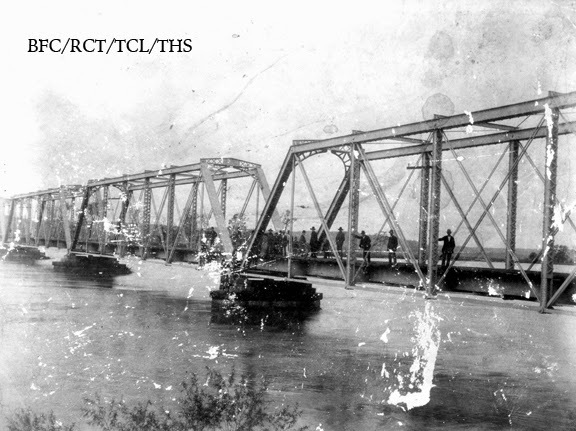 Rail cars were run out onto the bridge, in hopes of weighing it down and keeping it in place. It didn't work. 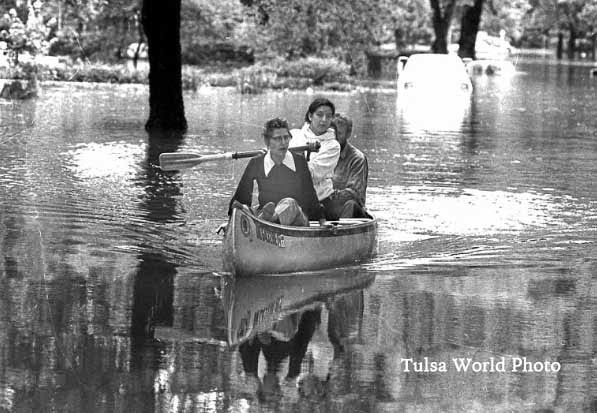 The river flooded Tulsa's waterworks, washed out part of that bridge (cars included) and displaced some 4,000 residents. 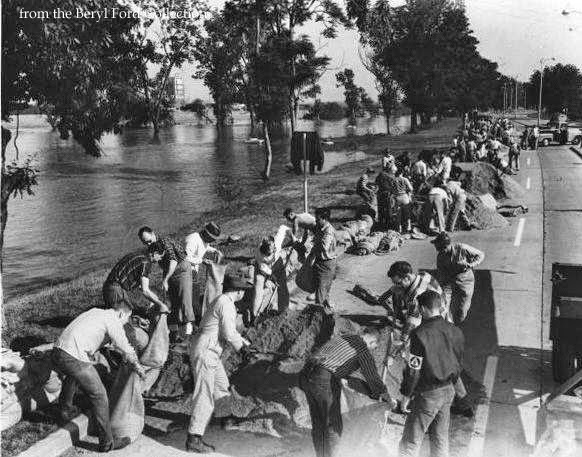 In 1943 the river came out of it's banks once again, spurring an emergency national defense project. The Corps of Engineers built levees around Tulsa's oil refineries along the river. 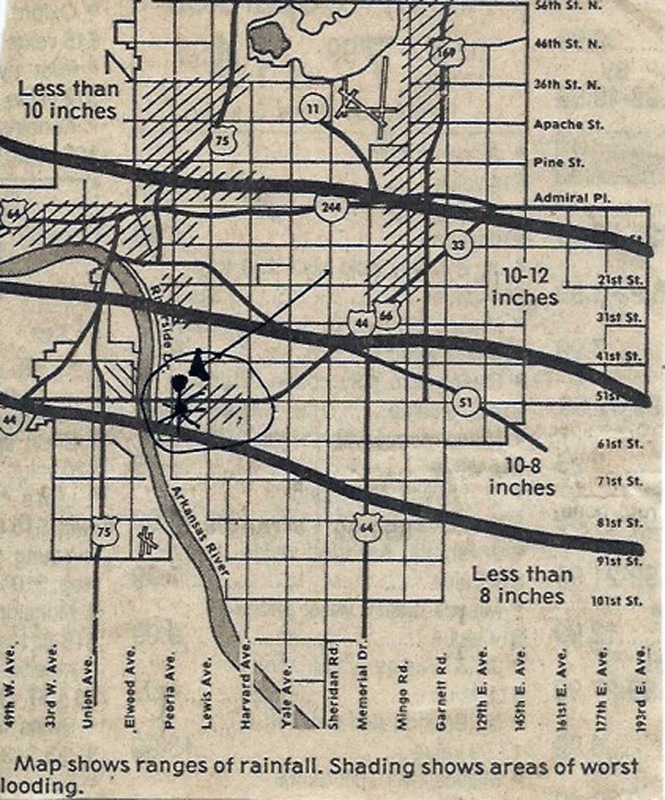 In 1957, the post-war building boom had positioned many residents in harms way as urban flooding became more predominate. Flood control came in the form of Keystone Dam. 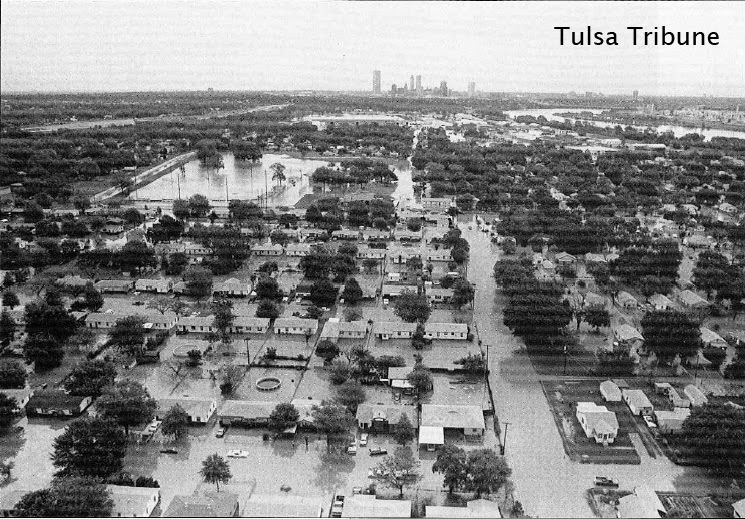 With the Arkansas River seemingly tamed, flooding turned to East Tulsa. 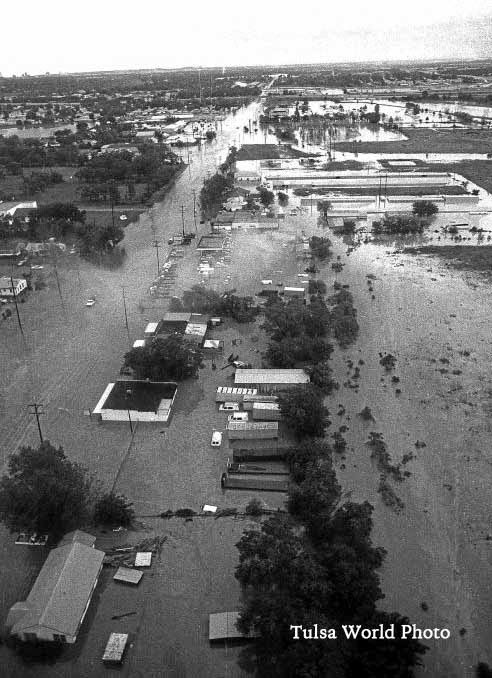 Mingo and Joe Creeks flooded on Mothers Day 1970. 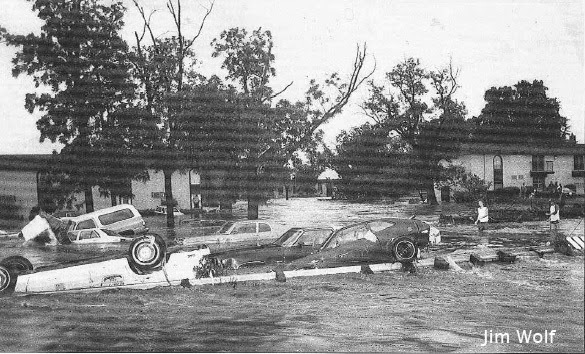 1974 was notorious for floods - 4 in all. 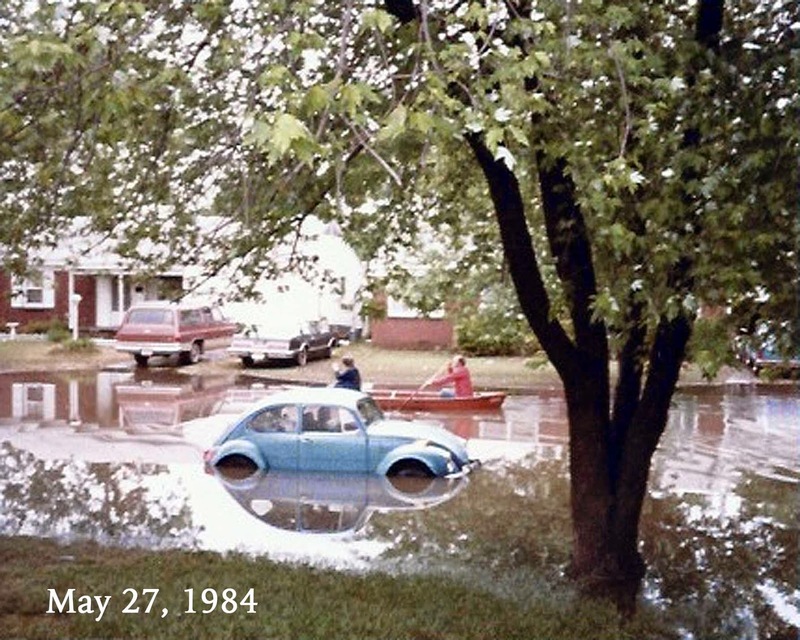 Then there was the Memorial Day Flood of 1976 where 10 inches of water fell in 3 hours. But the biggest and worst was yet to come. May 27, 1984 was a Sunday. It was Memorial Day weekend. I was a 25 yr old mother of a 2 1/2 yr old boy and a 4 month old baby girl. My husband had gone on a camping trip that weekend down in far southern Oklahoma, so I decided that evening to invite some friends over to play cards in our Brookside home. When the first of them arrived, it was starting to cloud up. When the last of them left that night, it was pouring. And it kept pouring. The thunder, lightning and incessant heavy rain made sleep nearly impossible and caused my son to crawl into bed with me at some time during the night. When I awoke in the morning, my first thought was that something was off. The sunlight was shining in the window and it was quiet. Too quiet. Then I realized that the power was off. And I could hear voices from outside. When I looked out the window, I just about fainted. Our bright, blue VW bug, that was parked out in the street, was almost completely submerged under water. The water quickly receded; this photo was taken an hour after I first saw it. 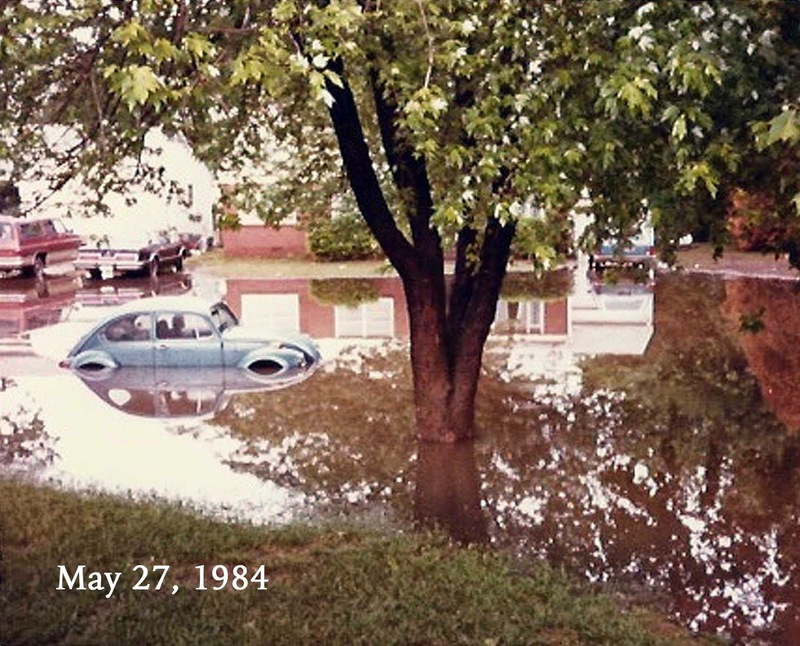 In fact, our entire street was under water. I felt cutoff from the world. After checking on my sleeping baby, I dressed and ventured out front with my son (who’s natural inclination was to head straight for the water) and observed the freakishness of natural disaster. Neighbors became links to the outside world, sharing what they knew or had heard. I went in and got my camera. And look! Here came our newspaper, being delivered via canoe. I didn't know that others were being rescued the same way. The now-receding water line mark showed it had risen to the top step of our porch. It had come inside our garage, up about 3 inches according to the water line on my washer. I'm thankful I wasn't aware of how close the water came to getting in the house as it was rising. I wanted desperately to get in touch with my husband, to let him know this had happened, that we were OK. There were no cell phones back then, but our land line phone still worked. I called other family members to find out if they were OK and what the heck was going on. I learned that a storm had stalled over the city and had dumped 15 inches of rain in a matter of hours. And that some parts of the city were OK, but others were not. And there were fatalities. I cut this out of the newspaper, drawing an arrow to where we lived. One of my sisters lived right next to Mingo Creek, between 31st and 41st. 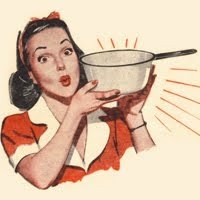 I knew that she and her family were out of town and figured her house had to have been damaged badly. Miraculously their house and the neighbors on either side were the only ones spared. Water reached her front door and came inside her garage. She counted her blessings later, after seeing what others endured. We all did. My husband finally did call from a pay phone, after hearing the news on the radio, and said they were heading home. Actually getting to the house proved more challenging, once they reached the city limits. It looked (and felt) like a war zone. It also brought us a lot closer to our neighbors. Through a concerted effort of many, they were able to help my husband get that old VW dried out and running in 2 days. We all pitched in and helped each other, as neighbors -and Tulsan's- always do.